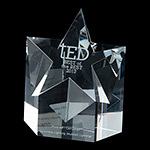 Columbia Lighting's LED Ad series featuring several of the brand's most recent LED products. 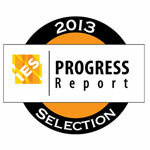 Columbia Lighting's LTRE product received a selection in the 2013 IES Progress Report. Columbia Lighting's LLHP is a long-life high-efficiency LED high bay product that meets the most restrictive lighting power density codes. 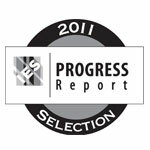 Columbia Lighting products STE and TRA have both received a selection in the 2011 IES Progress Report. 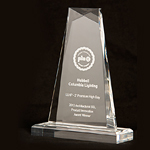 Columbia Lighting presents its e•poc® Full Distribution Luminaire in various advertisements that mirror the message within Columbia Lighting’s website and printed literature. 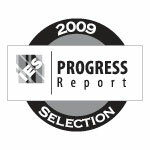 e•poc® Ad series includes: Healthcare, Educational and Business Environment Office Applications. Morph uses T5HO technology to bring fluorescent lighting back into the site lighting game by providing one-for-one replacement with traditional 400 watt HID, energy savings up to 52%, and economical occupancy sensing. 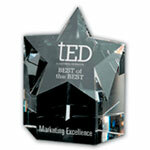 In recognition of outstanding overall readership of this advertisement as compared to all other advertisements appearing in TED Magazine (Feb 2009). 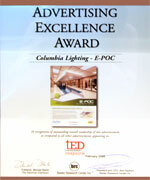 In recognition of advertising which achieved outstanding readership response as measured against all other ads appearing in Buildings (Jan 2009). The EnergyMax® Intersect is a 2-lamp, energy efficient, louvered luminaire designed to provide full distribution and energy savings in a crisp new look. Columbia Lighting is committed to providing you with energy management products, tools, and information through our createchange® energy-efficient lighting solutions. Our energy solutions are designed to reduce carbon emissions, mercury toxicity in the environment, and ultimately our dependence on foreign oil. 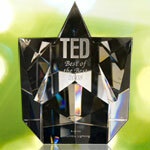 And just as important, createchange™ energy solutions immediately reduce your overhead. Columbia Lighting took their newly launched createchange® products on the road to train Columbia Lighting reps, sales force, and customers. 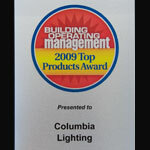 Columbia Lighting visited six cities during the week. The team covered 7,205 miles and trained approximately 360 participants in seven days. 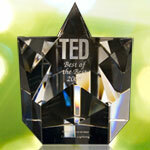 Columbia Lighting is committed to sustainable manufacturing practices. 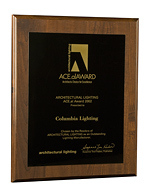 In recognition by the readers of Architectural Lighting Magazine as an Outstanding Lighting Manufacturer.